The perfect insurance agent pitch in 60 seconds – Working the chamber breakfast. I’m the first to admit that I have a strange affinity for networking meetings. A lot of people cringe at the idea of mingling with a group of strangers who probably want nothing more than to sell them something—I revel in it. The truth of the matter is that if you have a great elevator speech—a 60 second insurance agent pitch—networking meetings will soon become a lot less miserable, and with any luck at all, a lot more profitable for you! In fact, you can use your pitch in a wide variety of environments with great results. Let’s take a look at the best places to give your insurance agent pitch, how to make an effective pitch as an insurance agent, and how to end your pitch successfully. Note that I sometimes refer to the 60-second pitch as an “elevator speech” as others have said that it should take no longer than a short elevator ride to deliver. While each of these venues has a different personality and mission, they are all great options for speaking to large groups, shaking hands, and handing out a few business cards. Networking meetings are important because they get you in front of people who understand the value of networking, folks with their own rehearsed elevator speeches and 60-second pitches. Not only will they understand your plight, as brothers in arms they are likely to give you their business once you forge a relationship. Go ahead, join your local Chamber or Rotary Club, You’ll find the interpersonal opportunities phenomenal and you’ll become better known among business owners and leaders in your community. If you aren’t sure where to begin with this category, ask yourself about the industries you serve. Do you provide auto insurance? Life Insurance? Travel Insurance? Determine which people in your city are most likely to need the products and services you provide as an insurance agent. 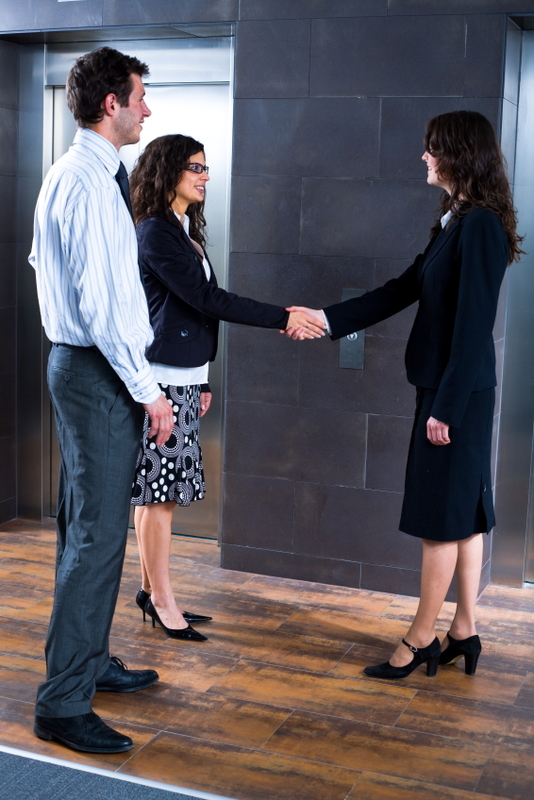 Who do you want to reach with your elevator speech or 60-second insurance agent pitch? Look for professional association meetings where these people congregate and join in as soon as you can. You don’t have to be a member of the industry to participate in most association meetings. If you provide a service or product that the members of a professional association could use, you will likely be welcomed with open arms. Are you headed to a Little League game this weekend? Could you sponsor a volunteer appreciation event for a local non-profit? Is a local school or scout troop hosting a spaghetti dinner for a great cause? It’s time to show up and support the good things happening wherever you live and do business. In the process, you’ll have the opportunity to introduce yourself to others attending and to give your best insurance agent 60-second pitch in the process. In fact, this may be one of the best times in the world to give your signature elevator speech as it is certain to come as more natural and conversational in a relaxed setting where you’re speaking to folks one-on-one. Alright then, now that you have an idea of where you’re going to deliver your 60-second pitch as an insurance agent, let’s discuss what makes a pitch the most effective. Don’t talk at your audience, talk to them. No one is really interested in a speech, but many people are willing to get to know you and what is important to you. Focus on these things when crafting your 60-second pitch. When I use the term, “60-second insurance agent pitch,” I mean 60-SECOND insurance agent pitch. Shorter is better. Go more than a minute and you will lose your audience in almost every situation. If you ramble, you’re defeating your own purpose. The pitch has a hook. Your hook should be different and memorable. If you have an unusual last name, give your audience a way to remember it. I know a doctor who tells patients his name (Dew) is like the soft drink Mountain Dew. They never forget. Your hook can also describe what you do in a cool way. For instance, an optician friend of mine tells people she’ll help them, “See in style.” Her target audience is women aged 24-64 and it works like a charm. Whatever it is, make a connection and communicate it well. The pitch offers up strong visuals. If you can paint a picture with your words, you’ll be better off. A lawyer that tells people he’s a bulldog and loves to fight gives a picture of what’s likely to happen when you hire him. A salesman who lets people he’s a successful distributor for ice to polar territories is certain to make an impression. Make sure your 60-second insurance agent pitch gives your audience a sense of value. Make it something that evokes sympathy or empathy. Offer up scenarios in which your audience could picture themselves. When something of your pitch is relatable, your audience is more likely to come back for more information later. Now, once you’ve crafted your pitch and it contains all the elements above, you’re ready to deliver it to the people that you meet while out and about—you’ll tweak it, you’ll adjust it to fit each situation, you’ll add to it and pare it down over time… until your elevator speech is nothing short of perfect—and every time you give it, you’ll feel a little more comfortable. Ask for your audience to reciprocate. Especially if you’re talking to an individual or small group, ask that the people who have just heard your elevator speech tell you more about themselves and their business. Not only is this considerate, most people will genuinely appreciate the opportunity and will remember you better in the future simply because you turned your 60-second insurance agent pitch into a real conversation. Offer a firm handshake and ask for another meeting. If you end a one-on-one delivery of your 60-second pitch with a handshake and a request to follow up and learn more about the person who’s just heard you out, you may be delighted by the results. “I’ve talked so much about me and I know we’re short on time; I’d love to get together for coffee Monday so you can tell me more about what you do.” It’s as simple as that – and you’re beginning to establish a relationship with your potential client. Yes, there’s amazing value in the 60-second insurance agent pitch. Craft yours well and you’re certain to enjoy the rewards of a business with more prospects. We’d love to know what works best in your experience. What makes your 60-second insurance agent pitch head and shoulders above the competition?